Experiencing Los Angeles: So where - or what - exactly is Los Angeles? One of the most confusing and difficult things about the City of Los Angeles (above, in blue) is knowing where it actually is. When someone says "Los Angeles" - what do they mean? Greater Los Angeles? 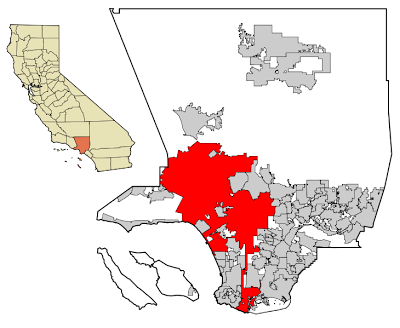 Greater Los Angeles represents a huge five county area (Los Angeles, Orange, Riverside, San Bernardino, and Ventura Counties) with a total population of 16 million people. Los Angeles County? 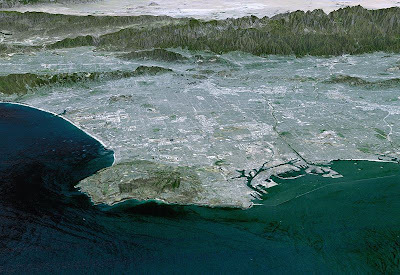 Los Angeles County (below) covers 4,061 square miles, and over ten million residents. The City of Los Angeles? 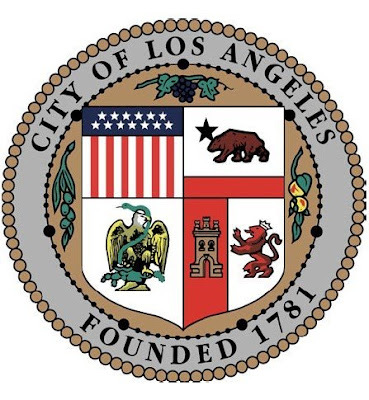 Located within Los Angeles County are 88 different cities (along with numerous "unincorporated" areas). The largest of these cities is, of course, the City of Los Angeles, featured above in red. 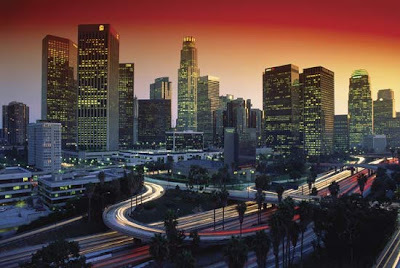 The City of Los Angeles covers 469 square miles, and has 4 million+ residents. It's huge - and is perhaps the most oddly shaped city major city in the world. 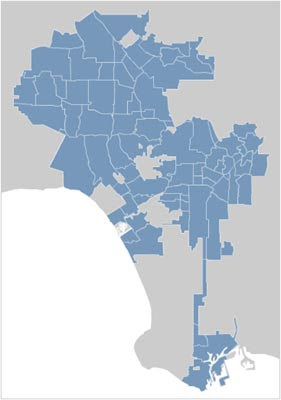 The City of Los Angeles consists of all the areas in white - and red. Downtown Los Angeles? In the map above, Downtown Los Angeles is the small red area. As you can see, it's no where near the geographical center of the city. From downtown, you can go less than a mile to the southeast - and be out of the city limits. Or, you can go 40 miles northwest and still be in the City of L.A. So where's the geographical center of the City Los Angeles? 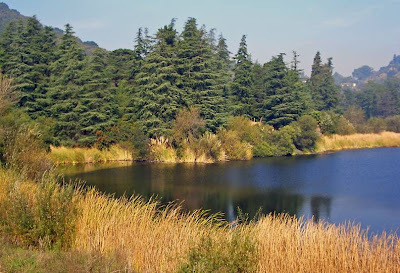 The Franklin Canyon Reservoir (above) in the Santa Monica Mountains. If it looks familiar, it's because it was used in the opening scenes of the old "Andy Griffith" show. Here's a link to some additional information from a previous post. As a Christian, I'm reminded of the importance of what a friend - and university professor in Europe - calls "the sense of place." Both Jewish and Christian Scriptures describe events in real places. Archeology continues to validate the historical descriptions found in throughout the Bible. More on the geography of Los Angeles, especially the City of Los Angeles, in a future post.